Last week, I wrote to Werner Bonefeld, seeking a couple of articles that were published in Common Sense. Journal of the Edinburgh Conference of Socialist Economists. This journal is pretty hard to come by these days. Back-issues are limited and relatively few of the articles exist on the web. It was published from 1987 to 1999, over 24 issues of about 100 pages each. As you can see from the image, early issues (one to nine) look more like an A4, photocopied zine than an academic journal, but later issues take the more traditional form and were distributed by AK Press. A few articles were collected and published in 2003. In my email to Werner, I mentioned that if I could get my hands on whole issues of the journal, I would digitise them for distribution on the web. As an editor of the journal, Werner was grateful and said that copyright was not a problem. I didn’t realised that Werner would send quite so many issues of the journal, but yesterday 15 of the 24 issues of Common Sense arrived in the post, along with a copy of his recent book, Subverting the Present, Imagining the Future. My plan is to create high quality digital, searchable, versions of every issue of Common Sense over the next few months and offer them to Werner for his website, or I can create a website for them myself. I’ve done a lot of image digitisation over the years but not text. If you have some useful advice for me, please leave a comment here. I’ll also seek advice from the Librarians here, who have experience digitising books. I have issues 10 to 24 (though not 11) and issue five. To begin my hunt for missing copies, I’ve ordered issues 1,2 & 3 from the British Library’s Interlibrary Loan service. An email this morning told me that the BL don’t have copies of the journal and are hunting them down from other libraries. We’ll see what they come up with. If you have issues 1,2,3,4,6,7,8,9 or eleven, I’d be grateful if you’d get in touch. It would be good to digitise the full set and I’ll return any copies that I’m sent. Our project is class analysis and we aim to provide a platform for critical debates unfettered by conventional fragmentations of knowledge (either into ‘fields’ of knowledge or ‘types’ of knowledge, e.g. ‘academic’ and ‘non-academic’). This continuity in the concepts of class struggle and social change flies in the face of most interpretations of the last 10 years. When the journal switched from A4 to A5 size, in May 1991 with issue ten, the editorial collective reflected on the first few years of the journal. Common Sense was first produced in Edinburgh in 1987. It offered a direct challenge to the theory production machines of specialised academic journals, and tried to move the articulation of intellectual work beyond the collapsing discipline of the universities. It was organised according to minimalist production and editorial process which received contributions that could be photocopied and stapled together. It was reproduced in small numbers, distributed to friends, and sold at cost price in local bookshops and in a few outposts throughout the world. It maintained three interrelated commitments: to provide an open space wherein discussion could take place without regard to style or to the rigid classification of material into predefined subject areas; to articulate critical positions within the contemporary political climate; and to animate the hidden Scottish passion for general ideas. Within the context of the time, the formative impetus of Common Sense was a desire to juxtapose disparate work and to provide a continuously open space for a general critique of the societies in which we live. 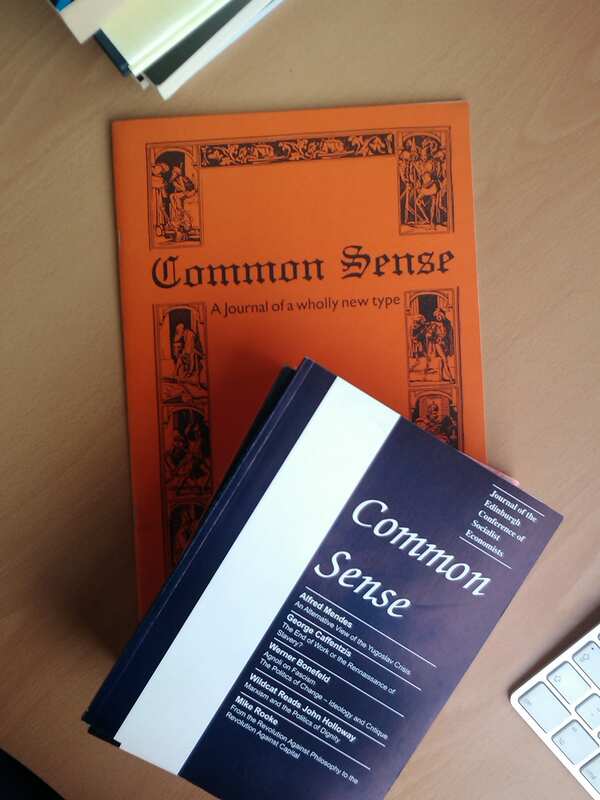 The producers of Common Sense remain committed to the journal’s original brief – to offer a venue for open discussion and to juxtapose written work without regard to style and without deferring to the restrictions of university based journals, and they hope to be able to articulate something of the common sense of the new age before us. Common Sense does not have any political programme nor does it wish to define what is political in advance. Nevertheless, we are keen to examine what is this thing called “common sense”, and we hope that you who read the journal will also make contributions whenever you feel the inclination. We feel that there is a certain imperative to think through the changes before us and to articulate new strategies before the issues that arise are hijacked by the Universities to be theories into obscurity, or by Party machines to be practised to death. The editorial in issue five, which you can read below, discusses why the journal was named, ‘Common Sense’. Hopefully, if you’re new to Common Sense, like me, this has whetted your appetite for the journal and you’re looking forward to seeing it in digital form. In the meantime, you might want to read some of the work published elsewhere by members of the collective, such as Werner Bonefeld, John Holloway, Richard Gunn, Richard Noris, Alfred Mendes, Kosmas Psychopedis, Toni Negri, Nick Dyer-Witheford, Massimo De Angelis and Ana Dinerstein. If you were reading Common Sense back in the 1990s, perhaps contributed to it in some way and would like see Common Sense in digital form so that your students can read it on their expensive iPads and share it via underground file sharing networks, please have a dig around for those issues I’m missing and help me get them online. The journal Common Sense exists as a relay station for the the exchange and dissemination of ideas. It is run on a co-operative and non-profitmaking basis. As a means of maintaining flexibility as to numbers of copies per issue, and of holding costs down, articles are reproduced in their original typescript. Common Sense is non-elitist, since anyone (or any group) with fairly modest financial resources can set up a journal along the same lines. Everything here is informal, and minimalist. Why, as a title. ‘Common Sense’? In its usual ordinary-language meaning, the term ’common sense’ refers to that which appears obvious beyond question: “But it’s just common sense!”. According to a secondary conventional meaning, ‘common sense’ refers to a sense (a view, an understanding or outlook) which is ‘common’ inasmuch as it is widely agreed upon or shared. Our title draws upon the latter of these meanings, while at the same time qualifying it, and bears only an ironical relation to the first. In classical thought, and more especially in Scottish eighteenth century philosophy, the term ‘common sense’ carried with it two connotations: (i) ‘common sense’ meant public of shared sense (the Latin ‘sensus comunis‘ being translated as ‘publick sense’ by Francis Hutcheson in 1728). And (ii) ‘comnon sense’ signified that sense, or capacity, which allows us to totalise or synthesise the data supplied by the five senses (sight, touch and so on) of a more familiar kind. (The conventional term ‘sixth sense‘, stripped of its mystical and spiritualistic suggestions, originates from the idea of a ‘common sense’ understood in this latter way). It is in this twofold philosophical sense of ‘common sense’ that our title is intended. Why is the philosophical sense a two-fold one? Classical and Scottish thought was always alive to the circumstance that senses (i) and (ii) of ‘common sense’ are interdependent. On the one hand, a public or shared sense amounts to more than a contingently agreed upon consensus only when those who share it are individuals whose experience is totalising: in other words they must be individuals who are self-reflective and thereby autonomous and answerable for what they do and say. On the other hand (conversely), individuals who thus totalise their experiences can do so only through interaction with others: that is, they can achieve totalisation and autonomy only as members of an interactive – a social or ‘public’ world. Individuality is here social without remainder, as Marx signals in his construal of the ‘human essence’ as the ‘ensemble of the social relations’ and as Hegel also signals when he urges that self-consciousness (human self – aware subjectivity) exists ‘only in being recognised’. Hegel draws the conclusion of the interdependence of the two senses of common sense when he urges that it is only in a community of individuals who are mutually recognitive that truth can appear. Having explained our title, it remains to justify it. The Scottish philosophers understood that common sense, in its two-fold meaning, enters crisis where ever (as in, according to their terminology, modern ‘commercial’ society) a social division of labour obtains. For then individuals become constrained to their role-definitions and functions: mutual recognition vanishes and, with it, autonomy; we can no longer see ourselves and our experience through others’ eyes. (Just as we can no longer see others’ experiences through our own eyes.) As in Burns, ‘seeing ourselves as others see us’ becomes less an actuality than a wish. In Hegel and Marx, the same theme is sounded under the heading of ‘alienation’. Marx perceptively connects alienation from our ‘species being’ (Gattungswesen)’ (that is, alienation from our capacity to be autonomous and self-determining) with alienation from others with whom we associate and interact. At one and the same stroke, the two senses of common sense are nullified or at least rendered problematic. Capitalism is that social form (or practical totality) wherein common sense (practice’s theoretical and self-reflective moment) enters crisis in an paradigmatic way. That which enters crisis can exist only critically. In an alienated – a crisis ridden – social world, common sense can exist only as critique; common sense exists as critical theory in a society which threatens to erode its roots. Conversely. inasmuch as truth and autonomy are (as Hegel emphasised) interdependent, the project of a critical theory can exist only as the project of a renewed common sense. Something of this appears in Gramsci, who urged that ‘common sense’ (in the sense of commonly agreed-upon obviousness must be translated into critical ‘good sense’ (common sense in our title’s meaning), and that such a translation can be finally effected only when ‘universal subjectivity’ (Hegel’s ‘mutual recognition’) appears. To achieve this, common sense has to thematise the crisis of the social order which challenges it: the crisis of common sense is not merely its own crisis, but that of the social order wherein its project stands to be renewed. Critique and crisis (or ‘theory’ and ‘practice’) are no less interdepedent than are the two senses of common sense distinguished above. Epistemological crises are social crisis and vice versa. To paraphrase Wittgenstein: to imagine a critical form of language is to imagine – but we don’t have to imagine it – a crisis-ridden form of social life. Hence, critique – the interrogation of existing circumstances – is the only brief which the journal Common Sense holds. In our initial publicity it was stated that, as a matter of editorial direction, ‘the only material to be excluded or anathematized is material which is boring’, ‘Boring’, here, has not just an aesthetic meaning. Rather, it refers to material which is uncritical in the sense of failing to place at issue the categories of the world it inhabits, i.e. the categories which proffer themselves as those of unselfreflective theorising whatever the topic of such theorising may be. Boring theory is theory which, lacking practical reflexivity, ‘recognises the world by means of different interpretation of it’, to quote once more Marx. The immodest goal of Common Sense is to place at issue anything and everything. Where enstrangement prevails, mutual recognition (the space of common sense) can exist, at most, only on the margins and in the interstices of a massified world. But crisis places the margins at the centre, and so this immodesty finds its justification. Placing anything and everything at issue, Common Sense relates ironically to ‘common sense’ in the sense of received (or soi disant) obviousness. Projecting critical theory as common-sense- theory, Common Sense builds on but also qualifies ‘common sense’ in the sense of that mode of thinking which in an estranged world happens to be public or shared. In an estranged world a shared sense is an enstranged sense. However, at the same time estrangement (alienation) exists not as a seamless monolith but as the movement of contradiction. Every social world, says Hegel, ‘is not a dead essence but is actual and alive‘: this applies to alienated social worlds too. Common Sense is the movement (the movement-towards-resolution) of the resulting contradiction. Common Sense is the centralisation of the margins, and the margins can be centeralised only as common sense. This is our last issue. Common Sense is no more. We, the editors, are exhausted. The demise of Common Sense had been on the cards since late 1998. The journal was left hanging in thin air when all but three members of the editorial board threw in their towels. Their decision was motivated by a number of reasons. Some disliked the political direction in which the journal had developed; others simply could no longer cope with the pressure of work. They felt burned out. Since its inception, Common Sense was a shoe-string operation. Financial trouble was a continuing nuisance and this is still the case. We are grateful to our authors: they kept submissions coming in on a regular basis. We are grateful to our subscribers. Thanks to you we were able to continue as long as we did. Yet, this is the end: Over the last few years, the editorial collective declined in numbers and this despite the fact that more people joined the editorial board. The committed core got smaller and smaller and burnt itself out. There was, then, a political problem: political work without enthusiasm, motivation, and endeavour transforms the question of politics into a question of administration that is discharged with an air of indifference. The core group was not indifferent but exhausted itself in it constant quest to maintain sanity in the face of administrative indifference of the many. Indifference stopped Common Sense in its tracks. They’re good – you have to do the page turns yourself, unfortunately, but the scanning is very, very quick; you can intersperse true b&w scans (which create by far the best images for text) with greyscale/colour plates, and the software does 180° page alignment and numbers the scans for you. Then we use Adobe Acrobat to combine all the scanned page-images into a single PDF, perform OCR on the text (which also straightens out any minor skew), and compress the file to a reasonable size. The end result is pretty good; you can probably achieve ~200 pages an hour; and humbly I’d suggest the best you’ll get with UL kit. Thanks, Paul. I was hoping you’d say something like this. 200 pages/hour would be excellent. I’m looking at about 2500 pages (or half that if I can scan two pages at once across the staples). I’ll come and see you soon. I was playing around with Google’s tesseract, which works fine, but requires a TIF as input and produces plain text. Ideally, I’d like to end up with a searchable PDF that can be exported to text if desired. I wouldn’t recommend scanning the page ‘flat’ across the staples, to be honest: it’s hard not to end up with a document where the OCR-ed text doesn’t follow the page structure. I.e. Will be parsed as ABC/JKL/DEF/MNO/GHI/PQR. Also, you tend to get nasty shadows. Hi Joss, a great project. I am meeting John Holloway on Saturday and can contact Ri chard Gunn in Edinburgh. If you need additional or missing issues I might be able to help. Thanks Mike. I’d appreciate it if you could spread the word. I imagine the first two or three issues are going to be difficult to come by. Just an update to say that the British Library have been unable to locate the first three issues that I requested via Inter Library Loan. I am also happy to say that Adrian Wilding has offered to send me issue 11. Really pleased to hear about this project Joss. I have a few issues at home so I’ll have a dig around to see if I have any of the early ones. Thanks, Julian. I’ve had a few offers and am currently in need of issues 1,2,3 and 4. I might also add here that if you and others allow me to keep any issues you send me, my intention is to collect the full set of 1-24 and then, after digitising it, offer the series to the British Library for preservation, as they do not hold the journal. I’m pleased to say that yesterday, I was offered all the remaining issues for digitisation. I’m still keen to collect a full set to donate to the British Library (or National Library of Scotland? ), so if you have early issues that you are willing to donate permanently, please do let me know. Thanks.